I was recently challenged to share why I’ve written several of my novels. I’m taking up that challenge today to give you some background on The Devil and Pastor Gus. 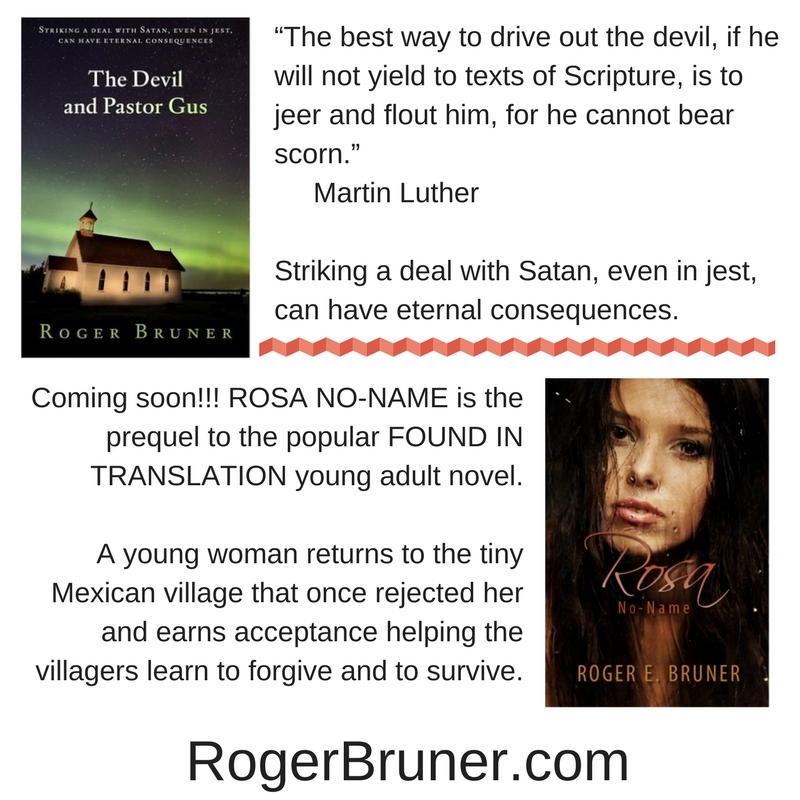 I’ll talk about Rosa No-Name next week. My minister father was almost a rabid fan of C. S. Lewis. Although he failed to introduce me to the Chronicles of Narnia, which I discovered quite accidentally while browsing the bookcases of a family I was spending the weekend with in Maine as an adult, he did mention the Screwtape Letters. Probably in a sermon. Even so, I never got to read it until eight or ten years ago. My father must have mentioned the fact that the Screwtape Letters is a satire about the Devil (Screwtape), who is sending letters of advice to his nephew Wormwood, who keeps failing to win the enemy (a Christian). I must’ve tucked those few facts somewhere in my head, because I ended up writing a short play, “B.L.Z.,” during the 1970s; it was published in a local, free magazine in 1977. The Devil, B.L.Z. (B.L.ZeBubb)–named after a very troublesome car my parents used to own–is getting ready to retire, but he’s afraid to turn the reins of his evil kingdom over to his son, Junior, who never ceases to do good when he’s supposed to be doing bad. So he gives Junior one last chance to prove himself. I won’t give away the ending, though. If you’re interested in reading the play for free, go here. Writing that play and having it published were fun, but–like so many other things I’ve written–I tucked it away for safekeeping and all but forgot about it. Ten or eleven years ago I wrote my first novel. And then a second and a third. I envy novelists who seem to have an unlimited supply of story ideas. I didn’t, and I still don’t. But something–I prefer to think of it as God’s inspiration–made me reread “B.L.Z.” Yes, the language was dated in a couple of places, but the basic idea was sound and I loved what almost happened to Junior at the end. Ideas began percolating, but was this truly a novel-worthy story? Once I started writing, I decided it was. I kept B.L.ZeBubb as the antagonist, but relegated Junior to a reference rather than an actual character. And what almost happened to Junior at the end of “B.L.Z.” almost happens to B.L.ZeBubb in the novel. I kept the selling of the soul to the Devil idea, but made Pastor Gus Gospello decidedly more of a protagonist in the novel than he had been in the play. And I tried to retain the satirical quality of the play as well. One thing I enjoyed in writing The Devil and Pastor Gus was having Gus battle typical problems in writing a first novel. Much of that had to be edited out in the published version, though. My publisher thought those details would be of less interest to most readers (other novelists would be the exception). Plus we needed to cut the length of the book by a number of thousand words. If you’ve read both the play and the novel, you can easily see the similarities and the differences. If you haven’t–and if you’re curious–it won’t hurt my feelings if you buy a copy of The Devil and Pastor Gus. Have I said anything you’d like to comment about? Please do!